Siri Larssen finds her clinics to be a good starting point for people to begin working through problems instead of around them. 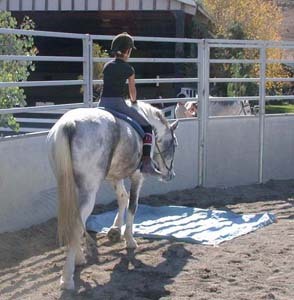 For many riders it is a challenge to recognize what is really going on with their horses and where to start in, particularly for those seeking a broader perspective in their training or for those who are not engaged in a regular lesson program. 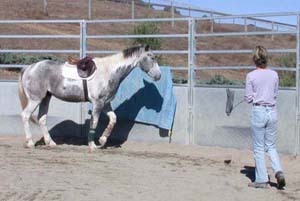 Siri notes that, when in competition, people are often driven to abandon their connection with their horses in order to win or look a certain way. 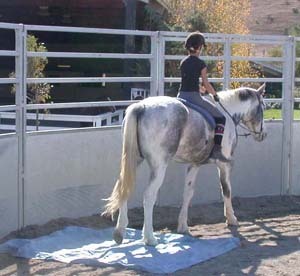 This can be very confusing to the horse, particularly in the new and oftentimes strange environment of the show grounds. 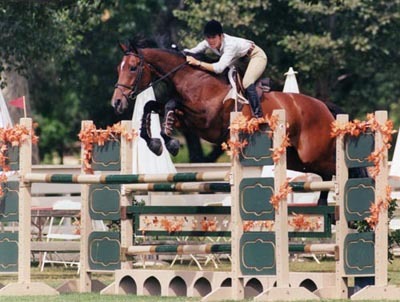 Just when a horse may be most unsure of his environment, the rider expects the best performance from him. 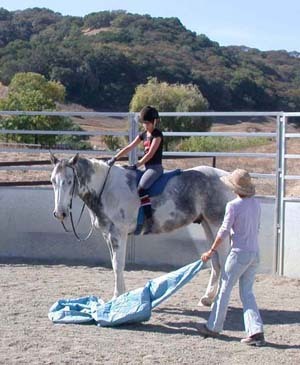 When the rider has lost his horse's attention he often feels compelled to coerce, force and/or drill to regain control. 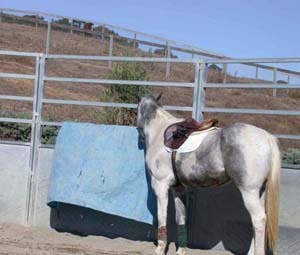 As an alternative to this scenario, Siri acknowledges the horse's perspective and begins to work from there, regardless of the surroundings. 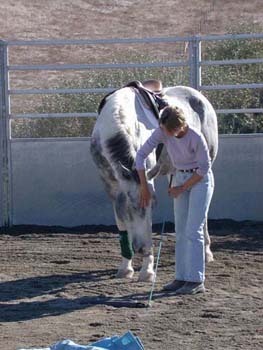 In this way she finds she has much greater success in reestablishing the horse's trust and a good working relationship that allows for better performance in the end. Because the clinic format can be structured in many ways, it can be tailored to meet the learning requirements of any variety of participants. 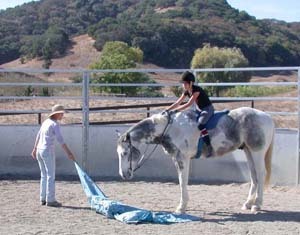 Siri says, "I enjoy working with horses and riders at all levels and like to suggest ongoing exercises to encourage progress. I place great emphasis on building trust and confidence between a horse and rider so that better communication can develop, a critical cornerstone to overcoming frustration and chronic problems. Oftentimes, a rider is caught up emotionally and unable to see the opportunity for a positive change. I love to see a horse's willingness reemerge when navigating through these important moments. The bridges that need to be crossed are not always easy to find, but they are there!" 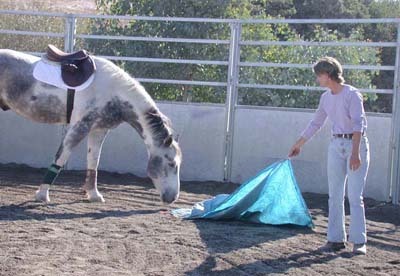 This series of photographs represent an example of an approach taken with a five- year-old horse that arrived very worried about flapping blankets and sudden movements. 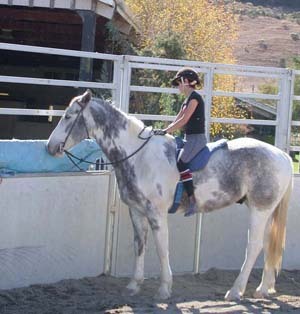 The rider, Emma, trusted me when I told her how I had gotten her horse ready for her to work with in this situation. She did a great job letting him check things out at his own speed. 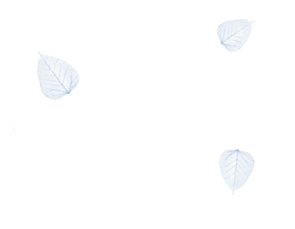 This helped him work through his anxiety without becoming unnecessarily tense as a result of being pressured by us.